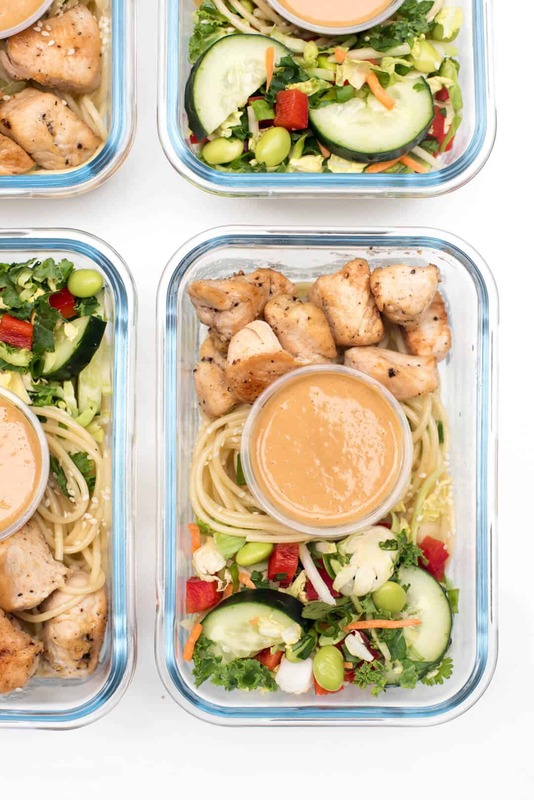 These flavorful, nutrition packed bowls are the latest in my meal prep adventures. There will be more. I knew exactly what flavors I was going for and this recipe hits the mark BIG time. There’s also a nice texture thing happening. 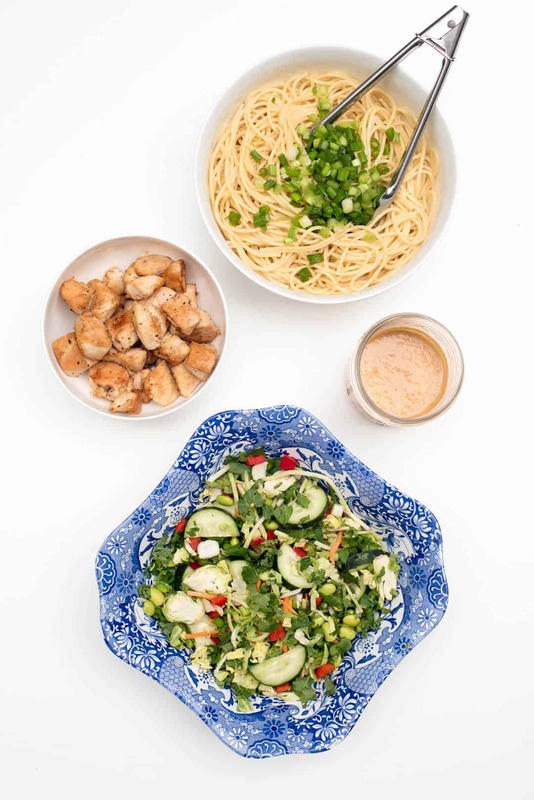 Cooked and chilled noodles, crunchy slaw, and sautéed chicken. It’s really a match made in heaven. I also love that it is eaten cold; no microwave needed. Just grab the container from the fridge, grab a fork, and you’re good to go. 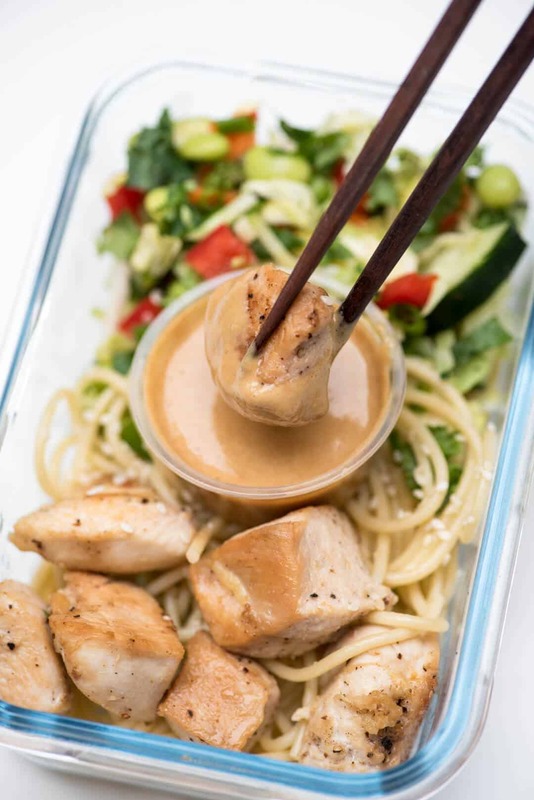 Perfect for sending to school with your peanut sauce loving high-schoolers or taking to the office for yourself. Or, can we have them poolside? Yes, let’s have them poolside. Oh, how I love peanut sauce. The one I make most often goes with my Grilled Chicken Satay but I wanted to do something a little different here. I set out to create a simpler version that didn’t require opening a can of coconut milk or heating anything on the stove. You literally just add everything to a food processor and pulse a few times, adding as much warm water as needed to thin it to the desired consistency. It’s fabulously addictive and adds so much to this meal prep bowl. Simply seasoned and sautéed boneless, skinless chicken breast chunks. Cooked spaghetti noodles that are tossed with sesame oil and topped with sliced green onion. Bagged broccoli slaw dressed up with chopped red bell pepper, chopped cucumber, edamame, green onion, and cilantro. 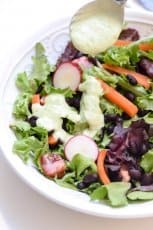 Look for a bagged slaw that contains sturdy ingredients like broccoli, cabbage, carrots, kale, and any other hardy greens that don’t easily wilt. 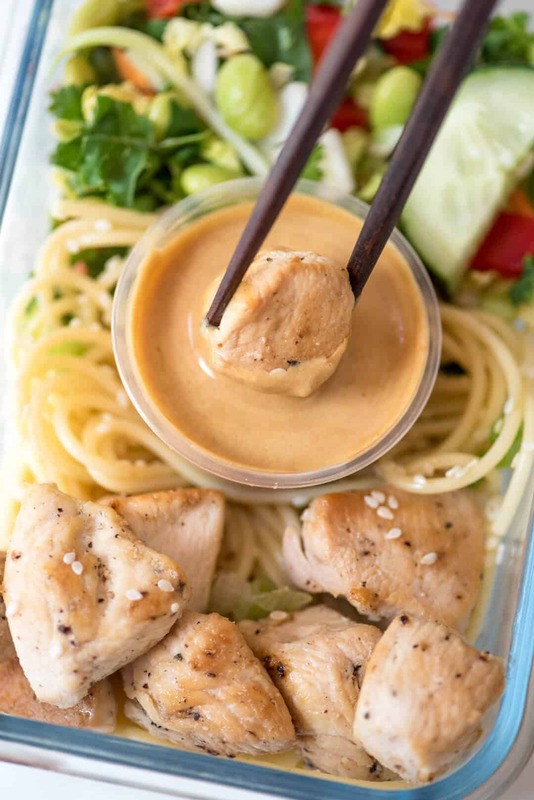 Divide the sesame noodles between four meal prep bowls and sprinkle with some sesame seeds. Top the noodles with the chicken and slaw, leaving a space in the middle for the dipping sauce. Nestle a small container of the Easy Peanut Sauce in the center. These little disposable condiment containers are super inexpensive and so useful to have on hand. 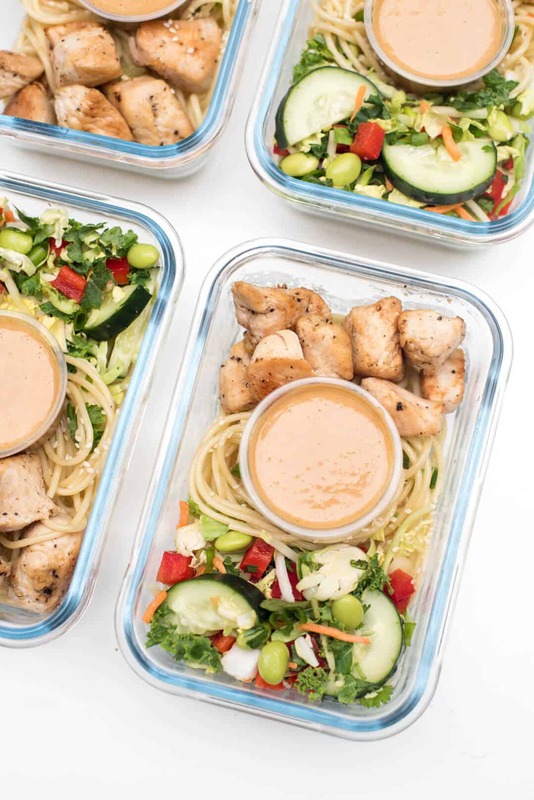 I recommend packing your make-ahead meals in a good quality meal prep container to ensure they will stay fresh and ready to eat through the week. Dip away! Or, just pour that luscious sauce right over the top of everything. 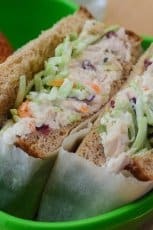 It works just as well as a dressing for the noodles and slaw as it does a delicious dipping sauce for the chicken. If you’re a fan of Tex-Mex flavors, be sure to check out my Tex-Mex Chicken Meal Prep Bowls. 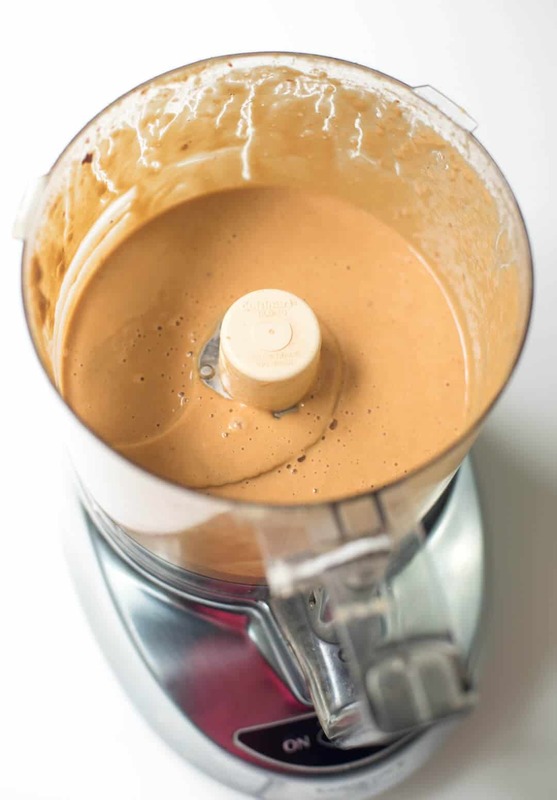 Add peanut butter, soy sauce, honey, rice vinegar, lime juice, ground ginger, minced garlic, curry powder, and crushed red pepper to the container of a blender or food processor. With the motor running, slowly pour water through the feed tube a little a time, until the mixture reaches the desired consistency. You want it thin enough to pour, but not watery. Transfer to an airtight container (a small mason jar works perfectly) and store in the refrigerator up to a week. Bring a big pot of salted water to a boil. Add spaghetti noodles and cook according to package directions. Rinse cooked noodles with cold water and drain well. Toss cooked and cooled noodles with sesame oil. Set aside. Add vegetable oil to a 10" skillet. Add chicken chunks and season with salt, pepper, and garlic powder. Cook and stir until golden brown and cooked through. Remove from heat and set aside to cool. 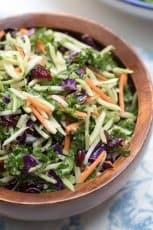 Toss broccoli slaw with veggies and cilantro. 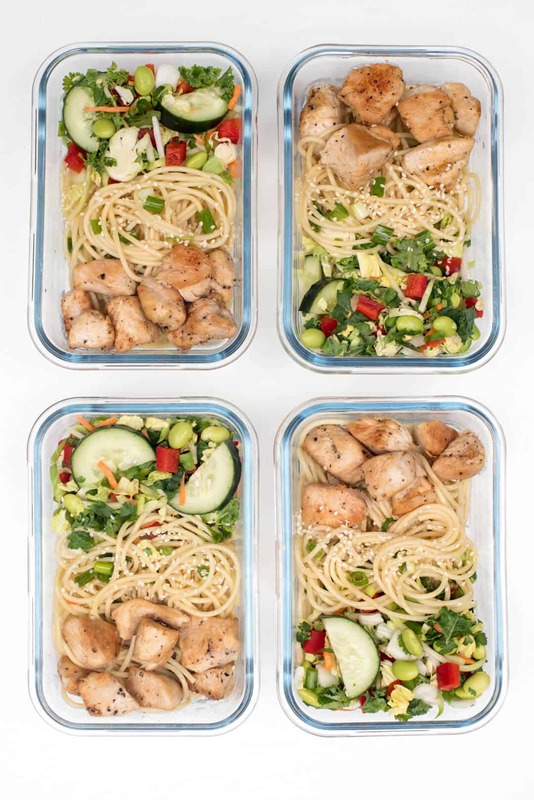 Divide chicken, noodles, and some of the slaw mixture between four meal prep containers. Sprinkle chicken and noodles with sesame seeds and/or chopped peanuts, if desired. 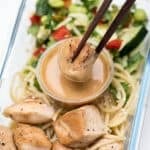 Add a small container of the Easy Peanut Sauce to each container. Keeps well in airtight containers for up to 4 days. These were wonderful!! Sauce is addicting! They were perfect all 4 days. Thank you so much! I’m so glad to hear it, Casey. I love the flavors in these bowls 🙂 Thanks for the feedback! Do you have any nutrition information for these? Love love love! So easy and SO good. Peanut sauce was perfect!! The Thai Peanut bowls were amazing! Just the right amount of crunchy and spicy. Will be making these often. Thanks for the great recipe! The recipe makes 4 containers in the size you see featured here. Love the recipe. How many calories though? Do you eat the chicken and noodles cold? Do you heat it up with the slaw? There is no need to heat it up. It is delicious straight from the refrigerator. My husband and I love it!!! We’ve made this as our weekly meal prep twice already and it is so so delicious. We added a little more PB than written and we pop the sauce in a glass container in the microwave before pouring it on. 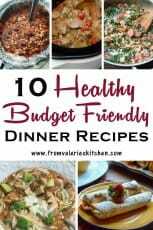 Thank you for the easy, tasty, oh so colorful, and healthy meal! You’re so welcome, Gabi. Glad you guys are loving it!